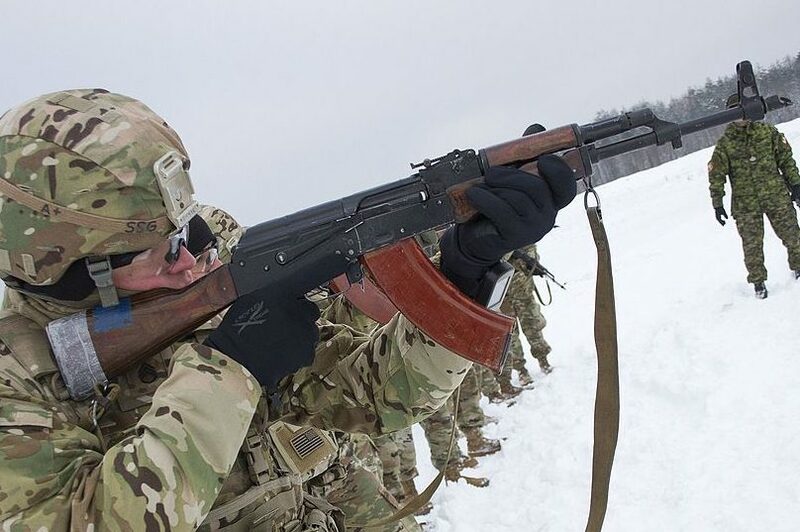 An American soldier aims his Soviet vintage AKM during an exercise. Via Wikimedia Commons. The world’s most produced assault rifle still enjoys robust demand 70 years since it was issued to the Soviet Red Army. 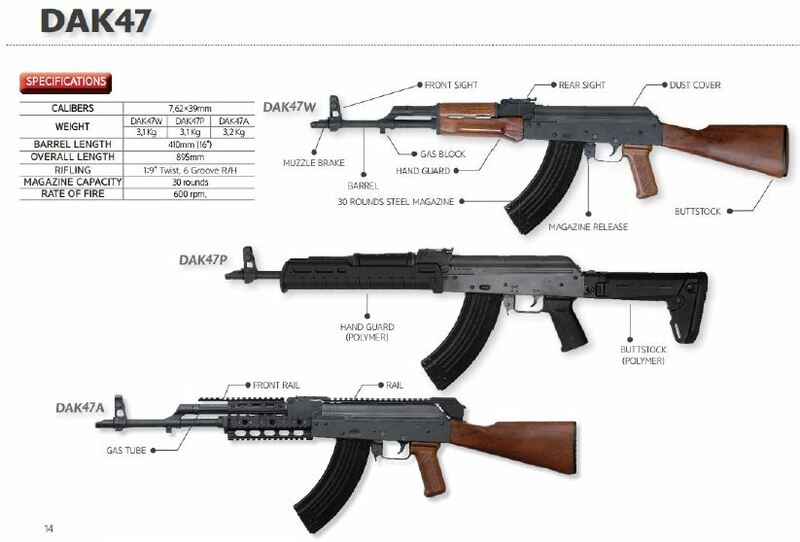 In circumstances best described as utterly ironic, faithful reproductions of the AKM–the stamped receiver variant of the original AK-47–are now made in factories above and below the 38th parallel. South Korea’s Dasan Machineries Co. Ltd. is a privately owned enterprise specializing in automotive parts. Since 1996 Dasan has slowly built a portfolio of licensed firearms for police use. Then there’s the DAK47. Contrary to its name, the DAK47’s appearance is an exact replica of the AKM that first entered production in 1959 and, unlike its counterparts from China and North Korea, has no discernible improvements. The advent of the AKM was meant to eclipse the original AK-47 as a cost-effective assault rifle for a mechanized army. While keeping the same appearance, the AKM swapped the milled lower receiver–a solid block of steel formed in a mold–for a thin steel sheet that was stamped and bent into the desired shape. These receivers are recognizable for a small ovoid depression above the magazine well. Another slight change was the addition of a slanted muzzle brake to dampen the barrel’s recoil. 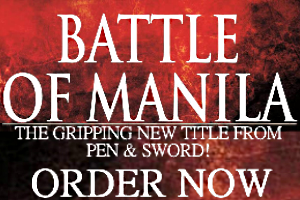 Via Dasan Firearms Group product catalogue. More than five decades since the AKM entered mass-production and 27 years after the collapse of the Soviet Union Dasan Machineries is the latest gun maker to roll out its own AKM’s under an ambiguous brand name. The DAK47 is sold in three configurations. There’s the original wood and stamped steel model; the same model with a milled aluminum handguard and a length of rail on the upper receiver; and an all black finish AKM with an aluminum handguard and side folding stock. Why Dasan Machineries manufactures AKM’s isn’t clear. But it’s probably to open a new revenue stream from exports. Civilian firearm sales in South Korea are negligible and Dasan’s catalog offers pistols, rifles, and shotguns for law enforcement and military use. The company’s bestselling rifles are its AR-15’s and the DK-2C1, which is an updated variant of 5.56x45mm K2 rifle used by South Korea’s army. For end users who have gripes about the AKM’s ergonomics, an AR-pattern carbine trademarked as the DSAR47 is available in either 7.62x39mm or 5.45x39mm. Dasan Machineries’ bold attempt at marketing a faithful AKM copy makes it the eighth Asian country to manufacture Kalashnikov-pattern rifles. While Chinese Type 56 assault rifles have spread across five continents, a few other states managed to keep their illicit small arms production under wraps. Below is a rundown on the bulk purveyors of knockoff AK’s. CHINA – The People’s Republic could be the earliest foreign adapter (not an adopter) of the AK-47 when its factories began mass-producing Type 56 rifles. China’s Kalashnikovs are recognizable for their chrome plated charging handles and “o” shaped front sights. Millions of these rifles were delivered to Cold War flashpoints in Southeast Asia and the Middle East and are still being sold today by Poly Technologies. INDIA – The Ordnance Factory Board (OFB) responsible for supplying the armed forces and the rest of the government with small arms have an “official” copycat Kalashnikov it calls the “Ghatak.” Like the DAK47 it’s actually a reproduction of the AKM in an all black finish and a two-piece polymer handguard with milled quad-rails. IRAN – Even if its state-owned factories know how to mass-produce West German firearms, the Islamic Republic may have begun making its own Kalashnikov rifles in the 1990s by using imported Chinese Type 56’s as a template. But authentic Iranian AK’s are hard to come by and the Revolutionary Guard seem equipped with a hodgepodge of guns. MYANMAR – Decades of civil war has left uncounted weapons with ethnic militias fighting for autonomy. At least one faction belonging to the Kachin minority are suspected of having clandestine workshops where Kalashnikovs are assembled with parts imported from China. Just like in Pakistan, these DIY firearms resemble Type 56 rifles albeit with atypical components. NORTH KOREA – The penultimate rogue state began making Type 58 rifles more than half a century ago. Since then, North Korean armaments factories have issued several variants with distinctive features not seen anywhere else. The North Korean analog of the 5.45x39mm AK-74, for example, is the only Kalashnikov-pattern rifle with a top folding metal stock. PAKISTAN –The army fought with Chinese Type 56 rifles during the disastrous 1971 war over Bangladesh. Larger quantities of Chinese weapons flooded the tribal areas in the 1980s at the height of the Soviet-Afghan War. The government’s ordnance factory doesn’t assemble Kalashnikovs but gunsmiths in cities like Peshawar are renowned for their plentiful knockoffs. VIETNAM – The country’s state-owned armaments factories have decades of experience refurbishing Kalashnikov rifles. It isn’t surprising to learn these same enterprises can assemble new ones from scratch and possess the know-how for making AK-103’s–these have muzzle brakes and use the same 7.62x39mm ammo.